Making of FE: Does page 81 confirm Priam is Ike’s lineal descendant? Also Japanese FE fan opinions…and Priam in general. Priam (Paris パリス in Japanese) is a character who appears in Awakening and is a source of debate among fans. Namely, whether he is Ike’s direct (lineal) descendant or not is something that fans go back and forth over. One fan wanted me to look at a blurb that appears on page 81 of the Making of Fire Emblem: 25 Years of Development Secrets book that apparently clarifies it. While it does lean more toward Priam being Ike’s descendant, there are enough counterpoints to not make it a decisive piece of the puzzle. As to why, I present you with a wall of text… and some tangents into the Japanese FE fandom. A character that appears as the descendant of the Radiant Hero Ike. He can be recruited on a DLC map. Also, “Paris” was Ike’s initial name in FE9. The left picture, by the way, is an initial shot from the early stages of Path of Radiance, showing off “Paris” (Priam) being his name, but is otherwise irrelevant beyond that Ike’s original name was Paris (Priam). It may not really say much for relations, considering FE6’s Roy was originally named Ike. Lineal Descendant: A direct descendant of a person. A person in direct line of blood relationship following downwards from an individual concerned, starting from his children, grand children and great grand children, are called lineal descendants of an individual. Collateral Descendant: A relative descended from a brother or sister of an ancestor, and thus a cousin, niece, nephew, aunt or uncle. One issue is the above are indeed legal terms. One isn’t quite sure if they would really go into such nuance for a game’s localization (or game at all). But the importance of the above is to show without said differentiation both can apply to the single word descendant. Note the use of singular bloodline, and the second definition of children/grandchildren. This implies that the Japanese word we are looking at indeed is referring to a lineal bloodline. However, I want to note that the word “bloodline” there still can mean “family line” as a tertiary definition. If taken as “the same bloodline of the Radiant Hero” (i.e. Greil’s, thus supporting those who prefer he be Mist’s descendant instead), the issue would appear to thus be in the fact it’s of Ike (and those who came after him). I would assume one would say “Of Greil’s bloodline” to include Mist (and all her descendants), but that goes back to the vague lineal vs collateral from before. A lineal bloodline of Greil would be Ike and Mist, but a lineal bloodline of Ike would not have Mist. So it would seem to pin it on Ike (and those who came after his blood, or in his bloodline, not one who would share his blood (i.e. Mist). The second definition of shison (children/grandchildren) helps deliver this lineal nuance, as being Mist’s child/grandchild would not qualify him as both a descendant of Ike as well as a child of Ike’s (or a child of Ike’s child, etc), as indeed he would be Mist’s. Note, I cut some synonyms out as they would all translate to “descendants.” Also take note of shison there as a synonym. I’m Priam. …The hypothetical descendant you were just going on about. What’s the difference? Just to be thorough, we should consider if there’s any nuance lost here in the difference of the two words. Shison is a general term for children, grandchildren, great-grandchildren, etc. Includes people who are still relatively close to the ancestor. Matsuei refers to a person after countless generations have passed. Basically, it specifically refers to a person at the very end of a line. For example: Oda Nobunaga’s son would qualify as his shison, but we can’t say matsuei. The professional skater Oda Nobunari is Oda Nobunaga’s shison, but also his matsuei. So the point of all that is to show that they are using a term that can be included within shison. However, the game’s use of matsuei, by this example, shows that he is likely a far descendant of Ike and not anyone of close relation anymore. Well where does that leave us? We don’t really gain much from the nuance beyond Priam being a distant descendant, rather than learning of which character (Mist/Ike/someone else)’s descendant he is. But, considering it’s a blurb written outside of the game’s context (whether or not he is claiming or lying about being a descendant of the Radiant Hero), they wrote that he is, in fact, a descendant. Unclear as to collateral or lineal, but descendant all the same. What about the interview this references? Q: So Lucina was already a character set to appear in the early stages of FIN (FE13’s working title), huh? A Yes. The planning stages had the theme of “coming from the future” attached to it. So then [we decided] Tiki’s would likely appear too. For the main character, we wanted to make someone like Ike (from FE9), and things expanded from there. B Speaking of characters connected to Ike, Paris* also made an appearance after awhile. This word is used in relation/connection (in terms of topic at hand style connection, not familial). Considering they were just discussing Chrom and how he was designed to be like Ike, he is simply using that to mention Paris, who is also “connected” to Ike. The “after awhile” is highlighted because のち may be misread as “descendant” (an archaic definition of the word, likely not the intention due to the addition of the に and so this is likely coincidence and translated accordingly). This is just to show I did consider it but that it’s highly unlikely. So, even though they basically said “speaking of those connected to Ike,” we do know that Priam at least has some connection to him. Whether it be his claim as the Radiant Hero, having Ragnell, or being blood related…well, nothing clear. Either way, that’s the interview tidbit that this side blurb was in reference to. What about what Priam is saying in the pic? Priam. The descendant of the Radiant Hero, in a way. 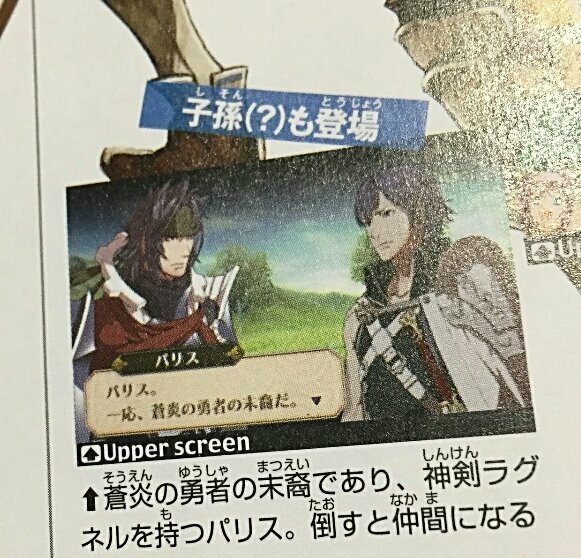 The context is that he just interrupted Chrom and Robin who were going on telling rumors about the descendant of the Radiant Hero. He interrupts and they eventually ask him who he is, to which he says the above. What caused the debate from this line alone is the use of the modifier 一応, which can mean “more or less” or “in a fashion.” Basically, may not directly be the case. It’s also the line on his Cipher card, though we’ll get to that later. Japanese fans on various threads I present in a later section too use the 一応 as a main reason (some parody it in their own posts), so it shows it holds significance as to the lack of clarity. Though Awakening’s localization is known for it’s changes/punching up, it does show they likely went with this being more of his show of attitude rather than being vague. But the counter to this counter is simply that Japanese fans often mention the 一応 as a reason that it can be taken vaguely as well, and thus, this may be a moot point, as we are indeed working with the Japanese texts here. The question mark there is self explanatory. “Shison(? )” (or “Descendant?”). Even they don’t know! The magazine is more recent than the Making of FE book, so is used as a counterpoint. The only drawback is that the Making of FE book probably holds more water than Nintendo Dream, and that the Making of FE book said such without any question. The Nintendo Dream (?) can be taken as more of a shared awareness with fans. There is no (?) here, oddly, but maybe they’re just quoting him. Either way this is an example of a more recent blurb contradictory to the Making of FE one. What about his Cipher card? They pointed out he only gains Ragnell in a more “future” appearance (the third card that features it) as that’s the higher level card. Note the word usage of “claims…bear descent” though. So while it’s not completely set in stone that he descended from said hero (indeed may have just been inspired by the man he saw), it also means that he may have existed independently of Mist herself, leaving Ike as the only candidate who, if he is blood related, that he could be related to. But the important part is, if Cipher is to be considered a canon source, that indeed Ike likely traversed the world. Though, perhaps it was a descendant of Ike that went to that world, and thus still could’ve been Mist’s? That’s getting foggy, but we did establish that shison is anyone down the line, and matsuei is the latest… but isn’t this becoming a bit of a stretch? Well, really, this entire article is a stretch. In translating the entire (relevant) portions of both volumes one and two, there is no mention of Priam anywhere! It’s important to note the recollection books were released long after Awakening, and thus Priam would exist somewhere, and likely be worth mentioning in relation to Ike –so some fans argue anyway. It’s possible hew as just deemed irrelevant to Tellius. So one approach was to simply look at someone who’s situation we are more clearly aware of: Marth. Marth is called Anri’s descendant, but we know it’s actually through Anri’s brother, Marcelus, as this was made more clear. So what term do they use in Japanese? So while nuance certainly exists, it’s ignored enough to not give much water to it’s usage in Priam’s sense, much like it’s English equivalent. What about Japanese fans? What do they think about Priam and what he means for Ike anyway? There exists this myth that the fans in the east are different than those in the west. The eastern fans are all okay with this, while the western are not. That sort of thing. But people often forget (and thus, discover) that there are more similarities than differences between the two sides! Just take a look at exemplary posts on sites that give you a taste of the Japanese side of things to get what I mean. Also, on the DLC map Xenologue 23: Radiant Hero, a man named Paris who calls himself the descendant of the Radiant Hero appears. The word for “calls himself” can also be “claim to be,” “wears the title of,” or “to reveal oneself as” (which he did, in his dialogue indeed). It’s vague in all directions rather than something more direct like the 25th Anniversary Book had said. This alone isn’t a counter example, however, as it can be applied to a lineal context. Alm and Celica’s descendant from Gaiden (considering the continent of Valm and its background) is heavily implied to be Valhart. Thus, within the world of Awakening, he and Priam are the only ones to be descendants of characters other than Marth. Fans wonder (and hope) that descendants of characters OTHER than main characters from past FE games will appear in the next FE game “Fates” and beyond. 1 Elincia, Mia, Titania, Aimee, or other female characters. 2 Soren or Ranulf. Oooh, aahh! 3 Actually he [Priam] is just Mist’s descendant. In this case if you think of it in context of shipping, people call Priam’s existence a “flag breaker” in the sense that he may have (in their eyes) dispelled some of the pairings they had come up with (such as Ike x Soren). Anyway, the three points they present are pretty much the same three main points that fans in the west reached too. Camp #3 shows that not everyone took the term to be a lineal descendant indeed, which was the main purpose of presenting the above. Now, let’s look at random comments. These mostly come from 2ch users strewn across various sites. Why the heck did Ike’s descendant come to Akaneia of all places?! Wait so who’s the mom? Elincia went with Geoffrey, Jill went home, and the other heroines are…ah, wait, Soren? The above initial reactions (and use of the word flag there) is to show they were under the assumption that it is indeed Ike’s direct blood that leads to Priam, and not Mist. These are just some examples, but there are no indications of any of them thinking of Mist at all. It’s often a trend that leans toward trying to guess who the mother may be, as they likely read it in a lineal descendant way. I don’t know much about it, but I’m just glad this means Ike isn’t a homo. [I guess] Ike sought to bury the claims of being gay by fleeing to another world. Though perhaps derogatory in some ways, I post these simply to show that based on the context and wording they were given with the games alone, the Japanese fans were quick to jump onto what they perceived as Ike having sired a child with a female companion somewhere (and therefore confirming to them that he must have had some feelings for women somewhere). Though others claimed there could’ve been illegitimate children, affairs, and all sorts of other scandalous encounters. Of course, Mist isn’t entirely unaccounted for (as we saw with Camp #3), take for instance this post from 2012. Most notable is the fact that Mist is considered a possible ancestor, but the author argues that Priam acts like neither Ike nor Mist. It then goes on a rather lengthy tangent (that I won’t translate in full here, but maybe someday) about how Priam is perhaps descended from Ephraim (of FE8 fame) and Elincia instead! It’d be really fun if he’s actually a descendant of Mist and Boyd. Wouldn’t that still make him a blood relative [of Ike]? There were other instances of Mist considerations, but few and far between (during my personal search, anyway, anecdotal evidence shouldn’t really hold much water, hence this note). So that means Ike was actually a lolicon…? Well, Awakening and Fates are games where parallel words exist, so anyone can just up and say things like “Priam could have descended from a slightly different version of FE9/10’s Ike” now. You know, like world lines where Soren or Ranulf were female…or even descended from Sanaki like >>48 [above poster] said. Other posts went into parallel world pairings and such. Basically, the precedent Awakening set up with it’s parallel timelines gave people free reign to make their favorite pairings come to life however they see fit. Alternate lines do have that drawback (or appeal?) to them, after all. Priam’s existence is a dark stain on history. I don’t know much about him but he looks like some vagrant who named himself the Radiant Hero. (in response to a user)The problem is his [Priam]’s Ragnell is fake, he can’t use Aether, and he looks like some vagrant. If that was a female Ike she’d be way more popular. If that were girl Ike she’d be SUPER popular. And if she had Aether she’d be able to have an Aether yielding kid! These more recent ones seem mostly negative. I suppose with a few more games after Awakening, fans had been able to move on from the initial shock, among other potential reasons. Interestingly, the comments in the above thread don’t really debate his lineage or who Ike may have been with, but instead mention how unlike Ike Priam is. A That’s just one thread, though. So it may not represent the current fandom mindset, of course. It’s possible, one could say, that they initially intended Priam to be a descendant as Awakening was intended to be the last game. They likely wanted to add a bit of fanservice for Ike’s fans before closing shop. However, we know Awakening was an unexpected hit, and thus the series resumed… and so they probably made use of what could be taken as vague language to help bring the fandom back to fantasize about Ike as they please. Aside from the Cipher cards, the company seems to be downplaying his general existence. It may be for those types of reasons, too, that things like this are never directly confirmed. Let the fans enjoy what they enjoy. After all, the only people who “lose” this way are those that would like to have some sort of confirmation or closure. But when it comes to imagination, everybody wins. The point of all these random fan comments are, again, just to show they are as varied on the topic of Priam as western fans are. Based on my own observations (again, a very limited search in the broader fanbase so please don’t consider it some definitive answer to everything), there are seemingly less fans that try to argue for Mist’s side of the family, and instead race to come up with (sometimes wild) theories as to how Ike eventually led to Priam. Cipher stating Ike (or who was likely Ike) traversed Marth’s world. Page 81 itself in the Making of FE book does seem to pin Priam as a descendant of Ike. It leans more toward a lineal descendant (rather than collateral), and fans who speak the same language often seem to be arguing via the assumption that it is via Ike’s specific line, which gives a bit more weight to this interpretation. However, there too exist fans who still consider Mist, just to a lesser extent (based on a limited search) than their western counterparts, meaning that this still isn’t any sort of definitive answer or evidence for either side. In the end, this may have just been a grand waste of your time if you made it this far. But I hope you learned how complicated even the smallest of issue can be. This took a lot longer than I wanted it to. I like this blog to be informative and give references, and often I shy away from things that rely on interpretation and simply stick to comparisons. But I hope I managed to twist this into a reference post in some way, even if it doesn’t really give much of an answer to the question. What do you think of the matter? I’d love to know! I wrote this in a few sittings in a very stream of conscious way, so please let me know if you spot strange inconsistencies or redundancies.